In 2008, Howard Schultz made the decision to return as the CEO of Starbucks to help the company restore financial health and return to its core values. 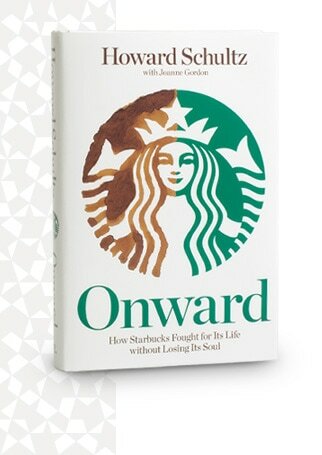 In Onward, he shares the remarkable story of his return, revealing how, during one of the most tumultuous economic times in history, Starbucks again achieved profitability and sustainability without sacrificing humanity. Now available in paperback. It’s bringing 10,000 employees to New Orleans to rebuild hurricane-ravaged neighborhoods because—contrary to what critics feared—the emotional capital the event built would be well worth the cost. It's refusing to cut health care for thousands of part-time baristas, despite pressure from outsiders who insist doing so would save the company. It's a journey that started 20 years ago in a northern California kitchen to develop a revolutionary product that most people insist will fail – and then successfully launching it. It's admitting imperfection by closing thousands of Starbucks stores for an afternoon, at the cost of millions of dollars, to retrain baristas on the craft of pouring the perfect shot of espresso. It's closing someone's favorite coffee shop forever, then asking talented people to leave the company, all with compassion and humanity. It's a woman in the Starbucks corporate office in Seattle hearing about a coffee farmer in Rwanda who dreams of owning a cow so her children can have fresh milk – and granting that wish.